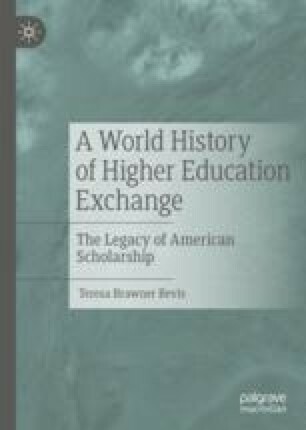 Many early foreign graduates of US institutions went on to become heads of government, top academicians, or champions of business and industry, achievements that helped cement the elite status of American higher education. Kings, queens, emperors, shahs, prime ministers, and presidents around the world were sent to study in the United States for their degrees, preferably in an Ivy League school, to best prepare them for positions of power and influence. A review of the educational backgrounds of past and current heads of government and other influential world leaders identifies those educated in the United States, their institutional preferences, and fields of study. The most recent university rankings are provided, national and international, and the numerous monetary and ideological contributions that have sprung from wealthy alumni are discussed. Feldman, Clarice. 2011. From the Muslim World, Big Donations to American Colleges, May 16. https://pjmedia.com/blog/from-the-muslim-world-big-donations-to-american-colleges/. Hu, Nian. 2014. The Culture Behind Donations to American Universities. Harvard Political Review, November 5. http://harvardpolitics.com/harvard/culture-behind-asian-donations-u-s-universities/. Leng, Shujie. 2016. Are Chinese Donations to American Universities Unpatriotic? China Daily, December 24. http://www.chinadaily.com.cn/opinion/2016-12/24/content_27758089.htm. Leung, Mimi, and Yojana Sharma. 2016. Caltech Gift Tops Year of Generous Chinese Giving to HE. University World News, no. 441, December 15. http://www.universityworldnews.com. Times Higher Education World University Rankings. 2019. https://www.timeshighereducation.com/world-university-rankings/2019/worldranking#!/page/0/length/25/sort_by/rank/sort_order/asc/cols/stats.